Kala jamun with ice cream is kind of a dessert that consisted of Fried Cheese balls soaked in sugar syrup and served with ice cream. These are Cottage cheese balls dipped in thickened flavored milk along with pistachio. 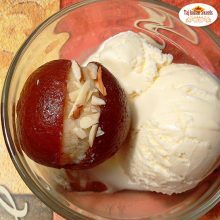 It is basically an Amazing combination of hot gulab jamun with ice cream in Australia that an Indian restaurant in Australia serves. Kulfi is a kind of Indian ice cream, that is served in different Indian restaurants in Australia that is offered in different flavours. 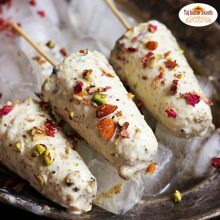 It is often known to be as “traditional Indian ice cream.” Kulfi is somewhat similar to ice cream in appearance and taste; though it is denser and creamier. 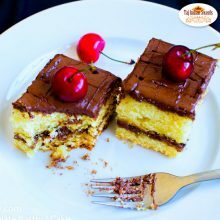 Kulfis in Australia comes in various flavours. 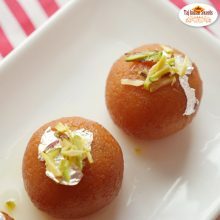 The more traditional ones are malai or cream, elaichi, mango, rose, saffron, and pistachio. Rasmalai is a mainly Bengali dessert or cuisine that is made of soft paneer balls that are immersed in chilled creamy, flavoured milk. 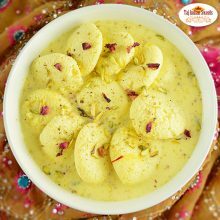 Similar to Rasgullas, Rasmalai is also made from homemade cheese known as “paneer”. 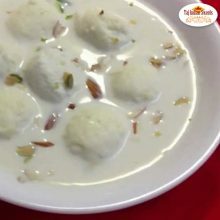 Instead of being soaked in sugar syrup like Rasgullas, Best Mango angoori Rasmalai in Harris Park we serve is immersed in sweet, flavoured milk. 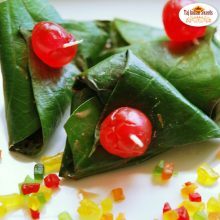 Meetha Paan that is made of betel leaves and it is taken with many fillings put on top. The leaf is covered up and chilled before serving. It is also known as meetha paan in Australia. Its an betel chew or paan that contain fragrant spices and rose preserves with chopped areca nuts. It is a tradition in India and in many regions to give Coconut, two Betel leaves, areca nut (pieces or whole) to the guests at any auspicious occasion thats why paan came into existence. Rasmalai is a mainly Bengali dessert or cuisine that is made of soft paneer balls that are immersed in chilled creamy, flavoured milk. 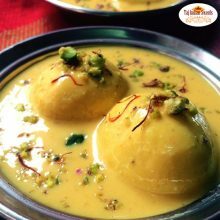 Similar to Rasgullas, Rasmalai is also made from homemade cheese known as “paneer”. Instead of being soaked in sugar syrup like Rasgullas, Best Rasmalai in Harris Park, Sydney, Australia is immersed in sweet, flavoured milk. 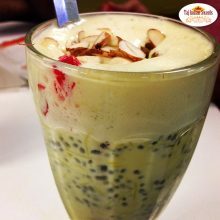 Rabdi Falooda (or Rabri falooda) is one of the most loved North Indian dessert which can take the taste to a heavenly level in summers. Rabri Faluda in Harris park served at taj Indian sweets and restaurant is a sweet, rich drink so thick it’s served with a spoon consisting of vermicelli noodles “falooda,” same as that in kulfi faluda and a delicious traditional sweet called rabri that is made of boiled milk, sugar, cream, cardamom and nuts. Taj Special Rabdi kulfi and Falooda is one of the most loved North Indian dessert which can take the taste to a heavenly level in summers. 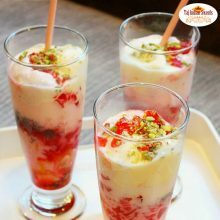 Rabri kulfi and Falooda in Australia is a sweet, rich drink so thick it’s served with a spoon consisting of vermicelli noodles “falooda,” same as that in kulfi faluda and a delicious traditional sweet called rabri that is made of boiled milk, sugar, cream, cardamom and nuts.